One of the smartest upgrades you can make to your RV is the investment in a tankless water heater system, essentially giving you on-demand hot water whenever and wherever you need it – all without having to worry about maintaining hot water temperatures around-the-clock. Folks that own RVs regularly find themselves on the kinds of adventures that routinely require them to have access to a hot shower afterwards. There is nothing worse than having to sit around and wait for your standard hot water heater to fire up and pump out enough lukewarm water for a quick shower – and that’s assuming you even have a standard hot water heater in your system. Some folks go with cold showers just because they don’t have the real estate available for those oversized appliances. Imagine that! With a tankless set up, however, not only are you going to have an opportunity to enjoy on-demand hot water whenever and wherever you want it but you also aren’t going to have to worry about your hot water tapering off as more people use it, either. Of course, finding the right tankless water heater system for your RV is nowhere near as simple or as straightforward as most people would think it is. With so many different options on the market to pick and choose from already, and more pouring into the market every day, finding the perfect tankless set up has become more of a challenge than ever before. By the time you’re done with all of the inside information, we highlight below you better understand exactly what you should be looking for in a new tankless water set up. You’ll know which features are important and which ones are little more than marketing buzz, what kind of setup is ideal for your particular RV and hot water needs, and what your budget is going to have to be to get your hands on a top-quality system you can rely on for years and years to come. So let’s dig right into the rest of this guide where we focus on the critical elements you’ll need to look out for when you want to get the right tankless water heater for your new RV! Where Are You Going To Install Your New Tankless Heater? What Kind Of Fuel Source Are You Looking For? The most important thing you can do before you go on the hunt for a new tankless solution is to figure out exactly how much water you use on average, and how much on-demand hot water you’ll need while you are driving around in your RV. Most folks (especially those that live in traditional homes or apartments) have absolutely zero idea how much hot water they run through on a day to day basis, or even how much water they use across the board. And it’s easy to understand why! Traditional taps seem to be unlimited sources of water that we don’t ever have to worry about running out, but nothing could be further from the truth when you’re talking about the water system on an RV. This is why you’ll have to figure out your water usage before you can comfortably start to research options to invest in when it comes to your new tankless setup. Obviously, you’ll need to figure out exactly how often you use each of these individual appliances to calculate exactly how much hot water you might need on a day to day basis. The overwhelming majority of top-tier tankless setups are going to be able to produce on-demand hot water at rates of anywhere between 2 gallons a minute and 6 gallons a minute, which may or may not work for your specific situation depending upon how you use your appliances. Another core question you’ll have to tackle before you can pull the trigger on a tankless heater is where you’re going to install this new appliance in your RV. One of the biggest advantages of this specific piece of technology is that you’re going to be able to avoid having a standard hot water holding tank set up in your RV. On the flip side of things, only the most modern RVs are designed specifically with tankless heating systems in mind, which means you’re going to have to find available real estate for this new tankless heating system to be installed. And that means finding out how to route new plumbing and electricity lines as well. Some people have taken to installing their tankless water heater to the outside of their vehicle because they do not have any room inside, which may or may not be acceptable in your specific situation. This is especially true if you’re going to be driving your RV to locales that have temperatures that get below 0°F on a regular basis, or if you’re going to be spending a lot of time in subfreezing temperatures as a general rule. 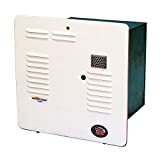 On top of that, different municipalities and state laws may have specific rules and regulations regarding how and where you can install your tankless heater, whether or not it needs specific ventilation and a whole host of other issues that will have to be considered before you simply slap your RV somewhere on your vehicle. This is something of critical importance to consider before you dive right in. Again, this is going to be entirely dependent upon how you use your RV, where you plan to park on a regular basis and the overall set up of your RV as it sits right now if you’ll be adding a new tankless water heater to it. The overwhelming majority of options on the market today fall into two different fuel sources – electricity or gas. You’ll have to figure out which one of these fuel sources works for you, not only from a budgetary standpoint (one of these fuels is almost always less expensive than the other, depending upon where you are at any one particular point in time), but you also have to figure out which one makes the most sense for how you anticipate using your new tankless solutions going forward, too. Electrical setups are going to require a pretty involved installation process, though some find them to be easier to use and more consistent. It certainly doesn’t hurt that they can usually be modified to run off of electrical hookups when you are “in camp” but also off of generator power when you are out in the wilderness, too. On the flip side of things, gas powered tankless water heaters are usually much less expensive with slightly higher hot water flow rates compared to their electric brethren. On top of that, gas powered systems are usually much easier to install. You will have to also consider installing a propane tank dedicated to the new tankless water heater somewhere on your vehicle, too. Should you run out of propane in the middle of nowhere you’ll be going without hot showers – something else to consider. Something else you want to think about when it comes to the fuel source you are using our any of the rebates you might be able to take advantage of that could offset the expense of investing in one particular tankless solution versus another. There are $300 of federal government tax credits for gas powered tankless water heaters that meet specific efficiency requirements, for example, that can significantly offset the expense of this new investment. It’s well worth looking into. At the end of the day, the overall design and layout of your new tankless water heater will have a huge impact on its utility and functionality as far as your day to day operations are concerned. You’ll want to look for a tankless water heater system that is easy to maintain and repair via DIY solutions, as getting mechanics or plumbing professionals out to your RV in the middle of nowhere can be pretty challenging. You’ll also want to look for a tankless water heater system that is easy to clean and maintain so that you can keep them running pitch perfect even while on the go. Some of the best systems out there are self-maintaining and self-regulating, though you’ll usually have to spend a little bit of extra money to get your hands on that kind of technology. Many find them to be well worth the additional expense, if only not to have to deal with the hassle and headache of tinkering with regular maintenance on such a key appliance. Of course, you’ll have to be sure to find a system that “plays nicely” with your plumbing set up as it exists right now. Most every unit can be modified to work with any RV plumbing situation, but some are going to be more user-friendly than others and those are the units well worth investing in. 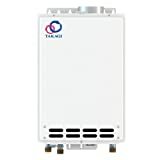 The biggest advantage with this particular unit – and the true stand out feature that helps it separate itself from the rest of the pack – has to be its patented “tube combustion chamber” that dramatically improves its heating efficiency capabilities, giving you a lot more on-demand hot water then you would get from almost any other RV tankless unit on the market today. A gas powered system, you’ll be able to enjoy upwards of 6 gallons per minute of piping hot water with this tankless solution installed. On top of that, it has advanced energy efficiency technology that allows it to utilize 90% of ALL the heat it produces to warm up your water, guaranteeing that you will be able to conserve fuel – and cut costs – without having to go without hot water. It is a little bit loud when it is running at full blast, but other than that it’s probably the best unit in the business today. This specific tankless water heater for RVs has been designed to utilize electricity to handle the heavy lifting of heating up your water supply, allowing it to remain a lot more compact than any of the other units available. Taking up less than half the space a 10-gallon hot water holding tank would take up, you’ll be able to effortlessly install this unit inside of your RV for on-demand and always consistent hot water whenever and wherever you like. Manufactured 100% in the USA, it comes with one of the best warranties in the business that you could set your watch to. The ability to run this hot water heater off of generator power when you go “off the grid” is another huge advantage. One of the most flexible hot water tankless heaters you’ll find on the planet today, this particular unit is legitimately portable. Not only are you going to be able to effortlessly install it in your RV but you’ll also be able to “pop it” out of your RV if you want to take it down to the shoreline to wash off a boat, clean out the horses at the barn, or just have a camp source of hot water separate from your RV. This is all possible thanks to the fact that it runs off of D cell batteries data guaranteeing you are not only able to use your RV when you go off the grid and get away from traditional power hookups but also guarantee that you’re able to enjoy hot water should your generator power go down as well. It doesn’t get much more flexible than that! Why Are Airstreams So Expensive?